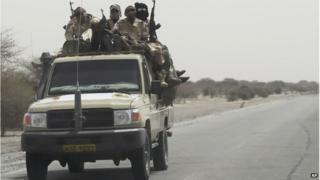 Forces from Niger and Chad have launched a ground and air offensive against militant group Boko Haram in north-eastern Nigeria, officials say. The campaign is said to be targeting militants in Borno state. It came as Nigerian officials dismissed Boko Haram's pledge of allegiance to Islamic State as a reaction to military pressure from Nigeria and its allies. The pledge was posted online on Saturday in an audio message by Boko Haram leader Abubakar Shekau. He called on Muslims everywhere to swear loyalty to IS leader Abu Bakr al-Baghdadi. Boko Haram has been fighting an insurgency to create an Islamic state in northern Nigeria since 2009, and in recent months the violence has increasingly spilled over into neighbouring states. Chad, Cameroon and Niger have already been helping Nigeria in its battle against Boko Haram. On Friday, the African Union endorsed the creation of a regional force of more than 8,000 troops to combat the group. However, the force's remit will be limited to securing the Nigerian side of Lake Chad, rather than pushing further into Nigeria. As the latest offensive began early on Sunday, a resident and an aid worker told AFP news agency there had been heavy arms fire close to Niger's border with Nigeria. A local radio station said that a convoy of more than 200 vehicles was moving towards the area, and that air strikes had been carried out on Saturday and early on Sunday. Army spokesman Col Sami Usman Kukasheka said the Boko Haram leader was like a "drowning man". Media captionColonel Sami Usman Kukasheka: "The military will definitely see to the end of the insurgency in Nigeria"
"There is no surprise that he is craving for support from fellow terrorists across the world," he told the BBC World Service. "Basically he's just trying to create panic to create a plea for help that will not even come because very soon we will see to the end of the insurgency in Nigeria." Why is Boko Haram so strong? Can regional force beat Islamists? A spokesman for the Nigerian government, Mike Omeri, said Boko Haram needed help "as a result of the heavy casualties and bombardment and degrading of their capacity". However, militants have continued to launch deadly attacks. On Saturday Boko Haram was blamed for a series of attacks in its former stronghold of Maiduguri, including suicide bombings, that left more than 50 people dead. Nigeria postponed national elections by six weeks until 28 March in order to have more time to try to improve security in the north. Col Kukasheka called on Nigerians "to be more security conscious because given the onslaught on Boko Haram definitely they are bound to spring surprises". IS took control of large swathes of territory in eastern Syria and across northern and western Iraq last year. It has forged links with other militant groups across North Africa and the Arabian Peninsula, and in January, militants in Afghanistan and Pakistan pledged their allegiance. Media captionJim Muir: "This makes them look more like a global franchise"